Good action, fun platforming, balanced puzzles, lots of humor. ith Ratchet & Clank Future: A Crack in Time being allegedly the final game in the Ratchet & Clank IP, it might make you wonder if Insomniac is getting bored with the series or scraping the bottom of the barrel for new content, but such is not the case. A Crack in Time, much like its predecessors, is a fantastic game. It's still the same formula, which by this time might be getting stale for some, but big fans of the series will love it all the same. A Crack in Time is the conclusion of the Future series, continuing the story from Tools of Destruction and Quest for Booty. Dr. Nefarious, who made his first appearance in Up Your Arsenal, returns as the main antagonist. The Zoni hired him to repair Clank (who turns out to be the "son" of Orvus, keeper of the Great Clock and controller of time). Instead, Nefarious kidnaps Clank and devises his latest plot to destroy the "squishies." It's the same formula, but it makes for a fantastic game.Gameplay is split between Ratchet sections and Clank sections. Ratchet sections are the same familiar platforming/action levels seen in the other games. Clank sections are different in that Clank plays a bigger role than in previous titles (aside from Secret Agent Clank). Clank must travel through the Great Clock, learning how to be its keeper. You must solve time-based puzzles along the way, using recorded entities to press buttons and reach different areas and open doors. The puzzles grow steadily more challenging in each stage of the clock, but don't reach the point of frustration. There are a few bonus puzzles to complete for extra rewards, which are much more challenging than the story puzzles. One of the key elements of any Ratchet game is the arsenal at your disposal. Some familiar favorites are back from previous titles, such as the Groovitron, Buzz Blades, Mag-Net Launcher, The Negotiator, and a new version of the Ryno. New additions include the Sonic Eruptor (an alien life-form that belches a powerful mating call), the CryoMine Glove (bombs that freeze enemies for a short period of time), and the Plasma Striker (a sniper rifle), among many others. The weapons are all a lot of fun to use and are improved over the weapons in Tools of Destruction. There are three customizable weapons, which you find expansions to throughout the game; changing their bullet type, damage type, or other factors. Weapons are only upgraded further by killing enemies. Space levels are handled a lot differently than the Star Fox-style levels from Tools of Destruction. You are able to free-roam within each galaxy, exploring moons and doing various space missions. The default controls felt reversed to what I'd expect, but that's easily fixed through the game's menu. Once you have visited planets, large vessels, and galaxies, you are able to warp between them quickly rather than having to fly to them every time. Clank plays a bigger role than in previous titles.The music is also good. Some of the best music is found by flipping through the radio stations on your space ship. The radio keeps playing while you explore moons. Hilarious commercials and news blurbs are added in between songs. The Groovitron has some good funky electronic loops, too. The game's only problems are some very minor framerate issues. Insomniac Studios is one of the few who have developed games in 60 fps, which looks absolutely gorgeous, but has the minor drawback of hiccupping every once in a while. Otherwise, the graphics look beautiful and are consistent throughout the game. With three difficulty settings and an unlockable Challege Mode, A Crack in Time offers a bit more challenge than Tools of Destruction. There are many skill points to unlock, lots of extra thing to do outside of the main storyline, and trophy support, so this title offers a high level of replayability. Another bonus for the die-hard fans is the addition of online leaderboards, which track your progress in the game so you can compare yourself with other players and climb to the top of the ranks. 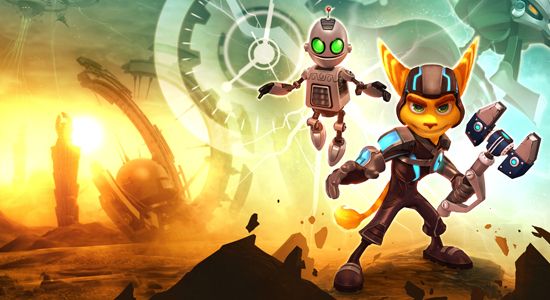 Ratchet & Clank Future: A Crack in Time is a must-play for fans of good action, fun platforming, balanced puzzles, and lots of humor.